House of Pain Jump Into New Tour: Group to perform five dates in March, including St. Patty’s Day gig in Atlantic City. 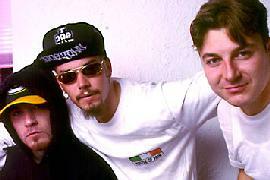 *Rap group House of Pain will hit the road in March for a series of performances honoring their Irish heritage, reports Allhiphop.com. Everlast, Danny Boy and DJ Lethal will perform five dates starting March 16 in Buffalo, New York and ending March 20 in Worcester, Pennsylvania. The highlight of the tour will be the group’s performance in Atlantic City on March 17 St. Patrick’s Day. DJ Lethal became a member of Limp Bizkit, and Danny Boy founded La Coka Nostra.